​Boomers 'R Heroes Members Received the AARP Caregivers of the Year Awards. It is with great pride that we acknowledge Boomers' group members G. Goss-Smith (GiGi) and Karen Harrison as 2018 Caregivers of the Year. These ladies were recognized with an award presentation at the AARP Movie for Grown-ups showing "What They Had", starring Blythe Danner, at the Ritz Five, 214 Walnut St. on October 30, 2018. We were given free popcorn and soda, yay!! Further, I was priviledged to participate in the panel discussion regarding Alzheimer's Caregivers and their needs. The panel fielded many questions from the audience of caregivers. It was a wonderful evening culminating with the movie presentation depicting a family struggling to understand this disease as it changes the dynamics of the family structure. It was very touching and heartfelt by all who attended. Laura N. Gitlin, PhD, Drexel University, College of Nursing and Health Professions. Jean Kirkley, Founder, Boomers Heroes Caregiving Support. Fredericka Waugh, Associate Director of Diversity & Inclusion Alzheimer's Association, Delaware Valley Chapter. Barry J. Jacobs, Clinical Psychologist, Family Therapist and Healthcare Consultant. The Honorable PA State Representative Chris Rabb bestowed this great honor upon me on Friday, March 15th. The West Oak Lane Adult Center was filled to capacity with well-wishers for all the many honorees hosted by Rep. Chris Rabb and his wonderful staff. 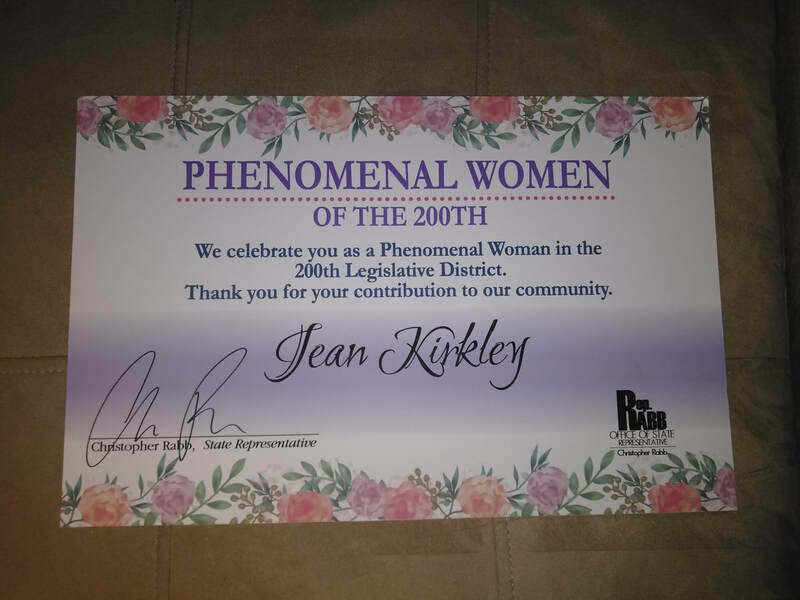 I was also honored to receive a Citation from the PA House of Representatives as a happy surprise. My personal cheering section, my ladies of Boomers 'R Heroes, Doreen, Beverly, GiGi and little Miss Maya (GG's granddaughter) made this a very joyous occasion, as the Phenomenal Sheroes they are. The full story was published in the The Philadelphia SUN.....click the bottom link. Boomers Shoutout with Q Harris, Yaaay, BOOMERS!! Folks, we've been staying busy getting out as a group whenever possible. It's not easy as our members are caring for loved ones and not easily able to arrange to get away. On Tuesday, Feb. 26, 2019, six of us made a brief escape from daily duties to enjoy ourselves and do some public relations work, as well. Members, G. Goss-Smith, Clarice Thomas, Jeannette Pinkney, Beverly Edwards, Linda Baker and myself were in the studio audience for the Q Show double-taping. We were on two episodes back-to-back. At the end of the second taping Q spoke with group members to shout-out about themselves. I enjoyed the best 38 seconds standing with Q and talking about Boomers 'R Heroes. It was a wonderful experience with my team shouting-out in that video, as well. After the taping, we went to the Hard Rock Cafe' for lunch and some laughs before heading back home to their caregiver duties. Only the highest praises to my Sheroes. We are all SHEROES. ​Happily, on November 10, 2018, we represented at the Walk to End Alzheimer's in Philadelphia at Citizen's Bank Park. GG Smith and Michelle Greaves were there to support Boomers in our effort to reach out further into the Caregiver community in our region. I'm so proud of these two ladies who were integral in that effort. On Thursday, October 25, 2018, the Intergenerational Community Alliances & Programs Inc. (aka ICAP INC.) was surrounded by friends, faith and community representatives and sponsors introduced its mission to the public. The event was held at Independence LIVE located at 1919 Market Street, with food catered by Aramark. The attendees were provided information by sponsors Independence, Common Practice, FunTimes Magazine, Gift of LIFE Donor Program, Stith & Associates Health Insurances, Always Best Care Senior Services, Boomers R Heroes, Native Dawn Associates and Dubose Business & Printing Services. “The launch provided a quality atmosphere to confirm our image as one of excellence in service to the faith and community organizations” said Sandra Lawrence, CEO & founder. ICAP INC. has three areas of focus, which are Palliative and Hospice awareness and education; the African American Heritage Program and BAV Girl Phenomena Inc. Two collaborations were birthed at the event which further emphasizes they are sincere and serious about service. I am so proud that Sandy saw fit to name Boomers 'R Heroes as a collaborator in this tremendous ontaking of the Aging Comunity in Philadelphia. As a part of the Palliative and Hospice education component, they will be the collaborative partners for the Philadelphia and vicinity to facilitate the Hello Conversation Game about living and dying. “We will provide workshops and seminars to encourage and educate people to make quality life care decisions to avoid crisis for caregivers and loved ones during the end of life stage. The Hello game helps to more comfortably discuss living and dying issues. Common Practice manufactures and created the game. ICAP INC. will be the primary lead in introducing this game in the Philly area,” said Jethro Heiko, CEO of Common Practice, the manufacturer and creator. Keep an eye out for us. Great things are about to happen for our aging community and their families. Jean Kirkley, CEO/Facilitator of Boomers 'R Heroes Caregiver Support Groups was keynote Speaker at the “Caregiving for the Caregiver: Mind, Body, and Soul.” The morning session took place at the WHYY Media Commons where CBS 3 and the CW Philly 57’s Emmy Award-winning health reporter Stephanie Stahl, served as the moderator for a panel discussion on the needs of family caregivers. Click link below for the full story and photos. Pictured with my esteemed panel member Louis Colbert, VP of Operations, Philadelphia Corporation for Aging. It was a priviledge to participate in this program alongside these esteemed experts in the caregiver field.